Trigeminal neuralgia is a disease of the nerve of the face called Trigeminal nerve, where the patient experiences intense pain on one side of the face. Trigeminal nerve is the largest cranial nerve emerging from the brain. Trigeminal nerve is responsible for carrying sensations like touch, pain, temperature arising from face to brain. It also helps in biting and chewing by controlling the muscles involved in these two actions. Trigeminal neuralgia is a recurring, chronic and extremely painful condition. Patient experiences sudden bout of extreme pain by mildest of stimuli like slight touch on the face, slight breeze or brushing the teeth or shaving. It is also known as Prosopalgia.It was formerly known as suicide disease as patients felt like committing suicide because of the severe pain associated with the disease. I. Medical treatment: This includes prescribing certain painkillers and muscle relaxants for pain relief. On a long run medical treatment becomes less effective with considerable side effects of the prescribed drugs. II. Surgical treatment: Once medical treatment becomes ineffective, patient of trigeminal neuralgia has to consider the surgical option. Trigeminal neuralgia surgeries are indicated in patients who experience the pain despite of the best medical treatment. It is more viable and effective treatment for trigeminal neuralgia where the medical line of treatment fails to offer any relief. It includes following methods. Microvascular Decompression (MVD): It is also known as Janetta procedure. It is a type of open surgery for trigeminal neuralgia wherein a small incision is made into ears and a small hole in the skull. With the help of microscope the trigeminal nerve is visualized and exposed. One can see a blood vessel either an artery or nerve compressing and irritating the trigeminal nerve. This is moved away from the nerve and a small padding is put between the nerve and the vessel. MVD is the most effective surgical option for the trigeminal neuralgia. It makes the patient of trigeminal neuralgia pain free. Risk involved with MVD: Although MVD is a very effective surgical option for the patients of trigeminal neuralgia; it has some risk of decreased hearing, double vision, facial numbness and stroke in the patient. 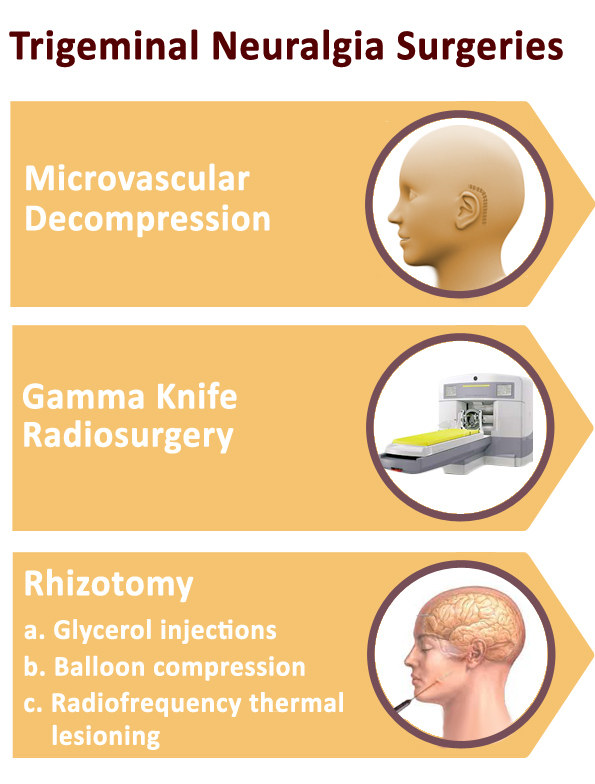 Gamma knife radiosurgery: This is a least invasive surgical option for trigeminal neuralgia. Technically, we cannot term it as a surgery as no incisions are taken on the patient’s body for this procedure. Gamma knife is a device with which a surgeon directs a focused, precise and controlled dose of radiation to the root of trigeminal nerve where it enters the brainstem. It damages the trigeminal nerve itself so that the nerve is unable to carry any painful stimuli. This procedure is done on outpatient basis. And it successfully eliminates pain in most patients. If the pain recurs, the doctor can repeat the same procedure. This is a risk free, nonsurgical option. So it is widely used for the patients of trigeminal neuralgia. Risk involved in Gamma Knife surgery: Mild tingling and numbness on the face is the only side effect produced by Gamma Knife surgery. Rhizotomy: It is a neurosurgical procedure where the nerve fibers causing facial numbness are destroyed by the surgeon. There are different ways of doing Rhizotomy. Glycerol injections: In this procedure the doctor inserts a needle or a tube through the cheeks and it is guided up to the Gasserian ganglion (a point from where the trigeminal nerve divides into three branches.) and a small amount of glycerol is injected which damages the nerve and thus blocks the signals of any kind of pain. Balloon compression: The trigeminal nerve is damaged by inflating the balloon with enough pressure. Radiofrequency thermal lesioning: In this procedure the Gasserian ganglion is heated and damaged with the help of a mild electric current passing through the tip of an electrode. Above procedures are aimed at damaging the trigeminal nerve itself which is unable to carry any painful stimuli to the brain. The patient can go home same day after undergoing the above procedures. This is all about the surgical ways of managing Trigeminal neuralgia. The surgical procedures do carry some risk of side effects like numbness of the face, bleeding, difficulty in moving the facial muscles.